Our model ACT pressure transducer is an analog compensated unit with a 0 to 100 mV output in pressures ranges from vacuum to 1500 psi. 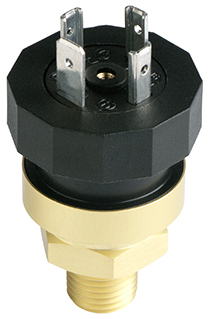 This family of pressure sensors have a ¼” or 1/8” NPT process connector and with an electrical connection of 18” cable or optional Packard connector. The Model ACT is extremely accurate, less than +/- 0.3% full scale over pressure. The universal design incorporates a stainless steel isolation diaphragm and 316 stainless steel construction for use with most media types. An economical non-isolated brass transducer, used for clean, dry media is also available. The ACT offers premium performance and versatility for use for many applications, both for the general industrial end user and original equipment manufacturers (OEM’s). It combines precision along with the durability to measure pressure under difficult environmental conditions.